Do not die from asthma. Following a primarily plant-based diet has been proven to reduce the risk of developing allergic asthma, as well as improve lung function in children with asthma within eight weeks. Eat plenty of starchy foods, grains, vegetables, and nuts to reduce your chances of developing allergic asthma. 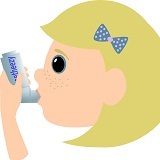 Reduce your child’s intake of eggs and dairy if they suffer from asthma.